I've been working on a little project for the last few days, where I decided to take advantage of software that I write at work to do some statistical modeling of my TSS vs. HR zones. As some of you may remember, when I first got my power meter I was eager to fill in my performance manager chart, and estimated TSS scores back about 2 months from my HR zones. I did the same basic idea then as now, creating a basic statistical model, but there were a few huge flaws: 1) I didn't have much data to work with, 2) I didn't have a good handle on my FTP so the correlation between the HR zones and the power data I did have was not really correct, and 3) I had strange HR zones set up in SportTracks, where I was exporting the data from, and I didn't realize it. Interestingly the "AR" zone ended up being unimportant and the regression fit better without it. The equation tends to underpredict; I did an outlier analysis and determined that in most of the instances (e.g. the two dots around 350 "actual") were days where I was feeling really strong and had more power at lower heart rates than usual. 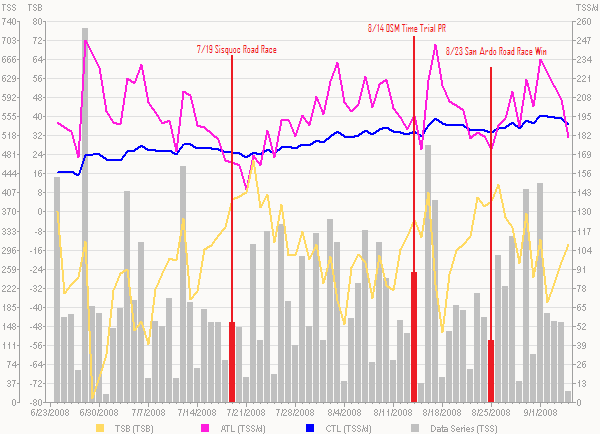 Also in my outlier analysis, I found that the week that I was riding on the trainer after my broken collarbone had much lower power than my HR would typically indicate, and because I hadn't adjusted my FTP for that timeframe, the "actual" TSS values were much lower than they probably should have been. 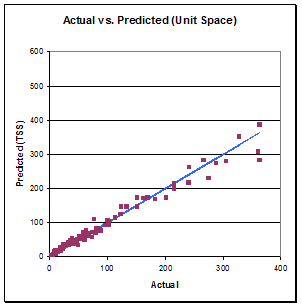 I eliminated those from the regression because they did not accurately reflect the data I was trying to model. The end result was that the TSS/day for period I had previously estimated was lowered somewhat. My CTL peaked at 170 TSS/day at the beginning of September right as I started tapering for EC and then a few days later I was hit by a car and broke my ribs, did EC, went on a business trip, broke my collarbone, and then started building again midway through October with a CTL of about 100. Back when I did it the first time, I found that my peaks corresponded with my best performances. You can see now that I have better data that although the TSS values were too high (like everyone said), the trends are still the same. For the record, I did this out of curiosity, not for any training purposes. I assume that my equation is applicable only to me, so I am not presenting this as some kind of catch-all model. So flame away, tell me I'm an idiot, whatever, I'm curious to know what everyone thinks. Last edited by umd; 11-26-08 at 11:49 PM. have you seen Nomad's spreadsheet to predict TSB? No, do you have a link to it? pretty sure it's in this thread. search this thread for tsb/nomad. it's a pretty slick program. I did something similar this year, so for rides where I didn't have my powertap I could still get an idea of the TSS for CTL tracking purposes. I just did a linear equation with avg HR and time. I can't imagine running my CTL up to 170. I'm completely beat down at 120. Good to see that others play around with this sort of junk. I messed around with something similar in an attempt monitor stress from cross training. During the winter months I do quite a bit of Nordic skiing and running and I like to add that fatigue to my ATL. I’m fine tuning a system where I have sport specific CTL measures but a combined ATL. The separate CTL values monitor how “good” I am at the various sports and the combined ATL just shows how tired I am. I think it would be foolish to combine the CTL values, as specificity matters, but I like the idea of adding the ATL numbers to measure fatigue and readiness to train. I also want a way to incorporate a few other life stressors into the ATL values. Stress at work, colds, etc reduce my ability to train but they don’t improve fitness. During these high stress times the performance manager is of limited usefulness as it says you’re fresh when you’re not. Long ago I read a thread where Dr Coggan joked about a fight with your wife being worth 45TSS or something like that. hmmm somebody should wear their HR monitor next time they get in a heated argument. Out of curiosity, how many hours a week does it take to carry a 170 TSS/d? On average, about 20... But there were a fair number of weeks with a lot more balancing the weeks with a lot less. that's a nutty amount of volume. nutty. ^ true statement. Does California have 32 hour days or something? I'm moving. I mean this in the most respectable way possible and am not trying to mock you at all, just sheer curiosity. But do most Cat 3-and-better amateur racers record and evaluate their training/riding data to this extent? I'm simply in awe of how much you know and record about your bodies' output levels, and wonder if this is something that I really should start researching and investing in if I choose to tune-up my training. Or is it more of a hobby within a hobby for a sub-set of riders/racers? I realize the benefits of it in relation to a very structured training program, but I don't really hear many guys talking about it outside of the forums. - I also realize that the Upper Midwest isn't exactly the Mecca of racing, and the circles of cyclists I am around probably don't have a care in the world of what their 1' power output is (read: mostly MTB racers). The price of power meters keeps coming down, so a growing portion of the racing population trains with power now. Do they all analyze it to the extent we do? Probably not. We're nerds. Let me just add to this discuss that I do not think that this much volume is necessary or even beneficial. I like to ride. I ride. I made an effort to cut my volume and increase my intensity this year, and you can see in my chart at the start of the year I cut it way down, but it crept back up over time, especially nearing Everest Challenge. Last year I rode a lot in the evenings in the dark this time of year, and this year I am not doing that. I don't usually analyze my data to this extent but the Edge units record all of it so its not difficult to do so, if so inclined. The software I used to do this, I write for my "day job", and although I know how it works backwards and forwards, I've never tried to actually "use" it. Doing so was actually enlightening, and I realized several things about it that I can improve. Also, our statistician that I consulted doing this, recommended that I write this up as a paper and present it at our user conference. You've got to have freak immune system . If my CTL ever got near 170 TSSM, I'd be sick as a dog. 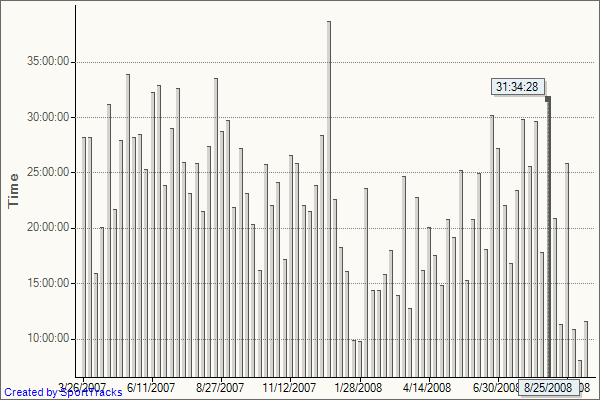 I can push maybe 3 weeks of ~900 TSS/Week before the fatigue leads to sickness. I'm planning on getting my CTL up to around 130 next season at the end of the build blocks, and that will be a stretch for me. If you don't have anything nice to say about anybody, then come sit next to me. My body seems to respond better with a higher CTL base. My best performances last year were around a CTL of 160. However, I didn't really have much structure other than 2x20s or 5x5s every once and a while, I just kind of threw volume at it. Now that I have a power meter I hope to train smarter and am currently sitting at about 140 right now and feel like my fitness is approaching my previous peak. I did 17, 16, and 22 hours the last 3 weeks... if I can keep around 20 hours and a CTL of 140 TSS I would be fine with that. With 2 kids, I have no idea what a 20 hour weeks is 11-12 is the norm, 14-15 is a stretch. That says to me you're riding around at around 60 TSS/hour. Until you said 20 hours I was questioning whether your FTP was set properly. Regardless, that's awesome that you get to ride that much. But don't you think cutting your hours by even 5 and adding extra intensity would get you more benefit than riding 20? Possibly... I do get a fair amount of intensity in, I don't think I could really increase the amount of intensity much if I dropped the volume. E.g. yesterday I had half an hour @ > 1 IF (hmm, well I guess it's .97 now that I bumped up my FTP in WKO) and today nearly 20 minutes @ > 1 IF. Doing SST now I'm racking up TSS faster and in a few weeks I'll start adding intervals. In January I'll drop the volume, it worked well for me at the beginning of last year. good job on the analysis, and the fact that you learned something about the software you work on is a major plus. Sorry about this but what's TSS?